The Connection at St Martins is a large centre for homeless people based in central London. The services they provide include; a day and night centre, outreach for rough sleepers, skills training & career advice, activity programmes and specialist support for complex needs. On average the building sees over 200 people a day. The charity felt that using digital signage was a way to inform visitors about the variety of activities and the range of services they provide, and wanted to ensure content was current and interactive. The main goal was to provide a space to showcase the creativity and achievements of their clients. 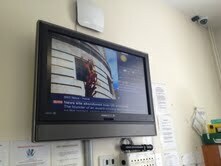 The Connection at St Martins currently has two screens provided by digitalsignage.NET, which both play the same content. One is a reception screen and the other is located in the main activity room. Using our digital signage technology, the centre is now able to show a daily schedule of activities including opening hours, meal times and group activities. The screens have many different functions and are used by the charity as digital advertising screens, digital information displays and interactive digital signage, where videos and photography produced by the clients can be exhibited. Chris Andrew, at Connection at St Martins, says the main reasons she chose digitalsignage.NET was because of the simple and intuitive design, the widgets that display fresh content (such as the weather and twitter), and the fact that it is cloud based meaning all the content is stored in one place. Since adopting the digital media signage, Chris has set up a digital media group each week where younger homeless people are given the opportunity to create their own content. With the help from her and her growing team of staff, they learn how to schedule the content for the signage systems themselves. This entry was posted in and tagged Digital advertising, digital signage, digital signage for charities, digital signage software by . Bookmark the permalink.